Our Vitality Elixir is a general tonic which can help with energy levels, focus, and increased immune response. A ginseng and cordyceps based formula, it provides both adaptodenic (adaptogens are natural substances that improve the body’s resistence to physical and environmental stress) and energy benefits that far surpass each herb on its own. This formula can be used daily and can be relied upon as a primary tonic for the system as well as a support for healing from disease, surgery or injury. According to Chinese medicine this combination replenishes qi and assists in supporting the function of the reproductive and immune systems, increasing fertility and overall health. A powerful support for both men and women, this non-habit forming supplement will quickly become a staple in your holistic tool kit. For men: Sexual health is at the root of male (and female) energy, drive, and well being. Vitality Elixir can help to support male sexual and reproductive health by increasing production of healthy sperm and Jing. In Chinese medicine, Jing is held to be the most condensed form of energy in the body; this formula can help to keep Jing full and energy levels high. For women: Infertility rates among women have increased markedly in recent decades due to increased stress, environmental degradation, and escalating rates of toxins, pollutants, genetically modified foods and pesticides. Both ginseng and cordyceps have proven impacts on the reproductive system, and can be safely added to a fertility regimen. Other benefits of this formula include enhanced physical performance, improved coordination, increased sexual potency, and cholesterol normalization. There is also strong clinical evidence that ginseng in particular can help to boost immune function, protect liver and heart health, normalize blood sugar levels, regulate hormone balance, and improve memory and cognitive functions. Directions: 1-3 Droppers full, 1-3 times daily, straight or diluted in water or juice. Shake well before use. Ingredients: Organic Chinese White Ginseng, Organic Cordeceps, Gingko Biloba, Ziziphus Jujuba, Ho Sho Wu, Chinese Red Ginseng, Chinese half-wild Ginseng, Purified Water, Ethyl Alcohol (30%). 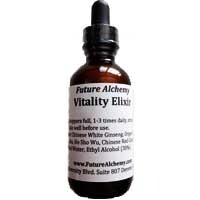 Be the first to review “Vitality Elixir” Click here to cancel reply.